Actually, looking at this, perhaps a mixed border of all the colours of the rainbow rather than lines from back to front. Like this a lot and it would be more doable/maneagable. 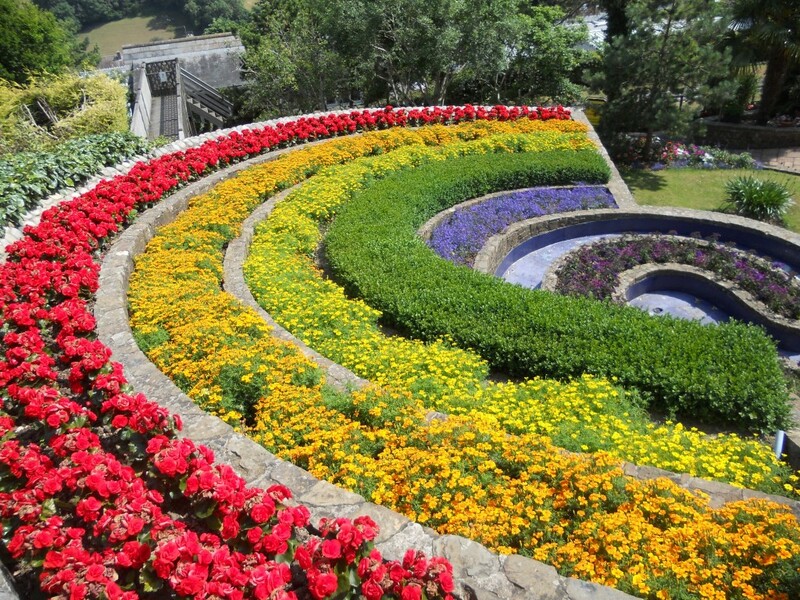 That said, a more structured, tiered border style rainbow might be stunning in a sensory garden, a feast for the eyes! I know nothing about flowers, but guess that finding the varieties of those plants you select, that all flower together to give the rainbow effect, may be a challenge. I await the outcome with interest. I know nothing about flower growing. It is talking them into flowering together that is important, Fee. It would be past my ability. At best I used to grow pansies for sale as a child. Now my idea is that if I or a sheep or horse can't eat it I don't grow it! The first one's do-able. the second one's gong to involve huge quantities of bedding plants being bought in unless you're prepared to have it look like nothing much most or the time. IMHO. Ah,yep, with you. I think the first is the way to go actually, can make sure there's at least overlap of flowering season of different flowers and if there are gaps it won't look too cack. 1. Perennials from seed will take a minimum of 2 years, more generally 3 years to flowering size. Columbines are relatively quick, but also short lived. 2. Cultivars are true-to-name so you are certain of what they look like / how they perform. Most perennial cultivars are propagated asexually - by division or from cutting or tissue culture. 3. Since you are not certain what arrangement you want for your rainbow border I would suggest starting with annuals to trial the color scheme. If you like something, make notes in a garden journal and look for perennials that copy the color scheme. 4. Yellows are the most intense colors to our eye when viewed in daylight. Lavender / violet / purple intensify towards evening. 5. Colors adjacent to each other on a color wheel are harmonious. Colors across from each other on a color wheel are said to be "complementary' which means they are in strongest opposition. A little goes a long way to accent the flower garden. For example - majority of flowers in blue / violet / lavender with a little yellow or pale orange to accent. 6. Silver foliage helps to harmonize flower colors. 7. Go to a paint store and collect as many color cards as you can discreetly take away. Lay them out on a green background and rearrange the different tints / tones / shade to find some combinations that please you. 8. In general, annuals have an extended flowering period. Perennials bloom for a matter of weeks (two or three, over here.) And you can only have one plant in one space. Figure on 18 inches by 18 inches for perennials. Peonys want even more. Annuals in many cases are good with 12 inches by 12 inches. 9. Buy perennials in smaller = less expensive sizes, fill in with annuals for the first year or two. Annuals will give you a longer flowering season, and you can play around more with them. I’ll bring the book up sometime. You could do a mixture of the two. 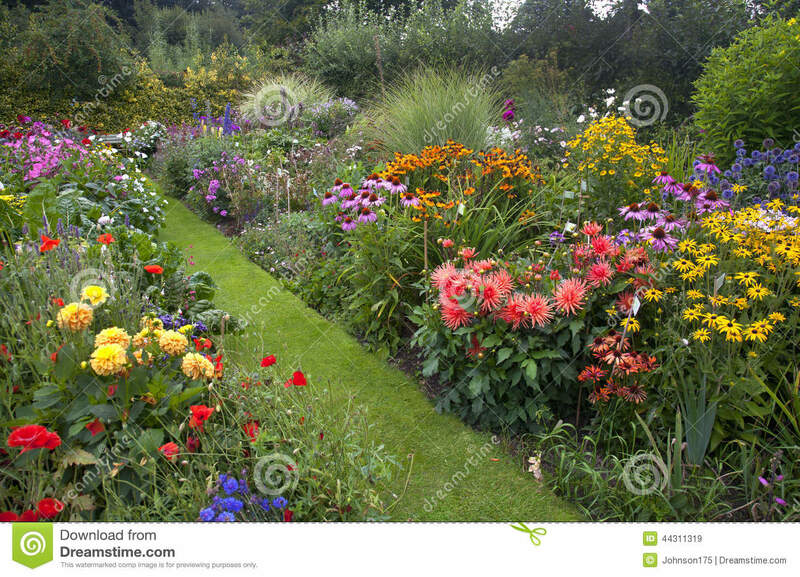 Why not borders that go from red through orange yellow green etc as you go along them. Looking from one end you would see the colours of the rainbow in order. Having them dotted around would be sensory overload if you didn't get it right. Jam Lady's advice is good, and particularly if you had the mixed up border. Quite a lot of annuals will seed too, so although you would only plant them one year, they would continue for several. We keep getting old fashioned columbine popping up everwhere in our garden, and borage is another one that once you have it it is with you for years. At a distance borage also looks mauve btw. If you want some scent, pinks and stocks are good for that, and you can get some good colour in them too. otherwise, as Sean says it will be buying in or raising huge quantities of bedding plants - plus a framework of permanent plants will give interest in the winter months too. I am going to suggest hardy geraniums (not pelagoniums) - come in a variety of colours, come back year after year, and slugs don't eat them. ot scented but the leaves are slightly furry. I might organise my cut flowers like this. If I ever get round to planting any.